The following order of appearance for the 2010 Drum Corps International World Championship World Class Semifinals was determined by the scores corps achieved during the World Class Quarterfinals on Thursday, Aug. 12. The World Class Semifinals will take place on Friday, Aug. 13 at Lucas Oil Stadium in Indianapolis. Remember, if you can't make it there, the event will be webcast LIVE on the DCI Fan Network. Open Class World Championship Semifinals Friday, Aug. 13 – Lucas Oil Stadium, Indianapolis All times Eastern Time Zone, approximate and subject to change. Crossmen - 4:30 PM Spirit - 4:47 PM Troopers - 5:04 PM The Academy - 5:21 PM Colts - 5:38 PM Glassmen - 5:55 PM Blue Knights - 6:12 PM Madison Scouts - 6:29 PM Boston Crusaders - 6:46 PM Intermission Blue Stars - 7:45 PM Santa Clara Vanguard - 8:02 PM Phantom Regiment - 8:19 PM The Cadets - 8:36 PM Carolina Crown - 8:53 PM Bluecoats - 9:10 PM The Cavaliers - 9:27 PM Blue Devils - 9:44 PM DCI Hall of Fame Recognition - 10:05 PM Open Class Individual & Ensemble Performance #1 - 10:08 PM Scholarships Presentation - 10:12 PM Open Class Individual & Ensemble Performance #2 - 10:14 PM Star of Indiana Alumni Performance - 10:18 Open Class Individual & Ensemble Performance #3 - 10:36 PM Age-Out Ceremony - 10:44 PM Last two scores announced - 10:58 PM. 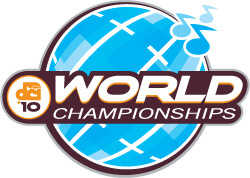 View a complete schedule of 2010 World Championship events.